"If you don't want to spend hours in the kitchen, try this recipe - you won't be disappointed! Very kid-friendly and delicious. I serve it with a fresh green salad." Preheat oven to 375 degrees F (190 degrees C). Place ground beef in a large, deep skillet. Cook over medium high heat until evenly brown. Reduce heat to medium. Drain excess fat. Stir in pepperoni, pizza sauce and feta cheese. Season with Worcestershire sauce, hot pepper sauce, salt and pepper. Continue cooking for 1 minute, stirring constantly. Lightly coat a cookie sheet with cooking spray. Separate biscuits and place on cookie sheet at least 3 inches apart. With bottom of a glass, press each biscuit to form a 4 inch round biscuit with 1/2 inch rim around the outside edge. Beat together egg yolk and 1/4 tsp water. Brush sides and edges of biscuits with egg mixture. Spoon about 1/4 cup beef mixture into each biscuit cup. Sprinkle with mozzarella cheese. Bake in preheated oven for 15 to 20 minutes, or until biscuits are golden brown, and cheese is bubbly. Allow to cool for 2 minutes before serving. 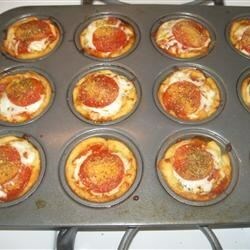 Individual pizzas made on English muffins with sauce, cheese and pepperoni. These are wonderful! The kids and hubby went wild! Couldn't wait to have them again. The kids loved these! I had a hard time pressing the biscuits out and never did get them out to 4 inches. It was also hard to get a rim around them, but I will probably make them again. Very yummy - interesting taste with the hot sauce and feta cheese. Took longer to prepare than what was indicated, but that was ok. Very heavy meal. Followed the directions except that we made them vegetarian, omitted the feta, and forgot the egg wash. The children topped their own and loved them! They are already asking to make them again.